1. UNINTENDED BENEFICIARY GETS THE MONEY. Many people don’t realize that a beneficiary designation for an IRA account trumps any directives stated in a Will. For example, if you list your son as the sole beneficiary of your IRA, but in your Will you state that you want the IRA proceeds distributed among your 3 children, the son designated as the beneficiary will receive the entire IRA. If you want all of your children to share the IRA, you must change the beneficiary designation forms for your IRA accounts. Another issue is where you name your estate as the beneficiary. In that situation, the IRA accounts will be included as part of your probate estate, where they may be subject to the additional problems discussed below. If you didn’t name a beneficiary at all, the IRA custodian documents will determine the default beneficiary. Some custodians provide that where no beneficiary is designated, the account will go to the surviving spouse; if there is no spouse, then to surviving issue (i.e. children and grandchildren); and then to the account holder’s estate. Other custodians may state that the default beneficiary is the estate, bypassing other heirs. Again, if your IRA accounts go to your probate estate, other complications may arise. Note that in all of these circumstances, the failure to properly name your intended beneficiary means your IRA account may go to someone other than who you intend. 2. IRA ACCOUNT GOES THROUGH PROBATE. As mentioned above, if you don’t properly designate a beneficiary and your IRA account passes to your estate, your family many unnecessarily spend additional time and money on the probate process. In addition, your heirs will have to wait for probate to be completed before they get the money. If they had been named beneficiaries, they would receive the funds much more quickly. If you die before April 1st of the year you reach 70 ½ years old, your estate will have to pay out all of the IRA’s funds within five years of your death. If you die after age 70 1/2, the estate will have to make distributions over your remaining life expectancy. The practical effect of this is that the money in an IRA account will be withdrawn and taxed sooner if your estate is the beneficiary, which means there is less time for the money to grow tax-deferred. To avoid problems with any of your accounts or insurance policies, you should regularly check your beneficiary designations. 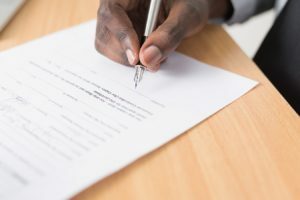 Once every few years, or anytime you have a significant life event in the family (birth, death, marriage, divorce), is a good time for reviewing these documents. For more information on effective estate planning, read our related post on Estate Planning Documents Needed To Avoid Family Conflict When You’re Gone. If you are interested in learning more about designing an estate plan that is right for you and our family, please contact our office at 631-777-2401 and schedule an appointment to come in for a consultation. THE LATEST ON NEW YORK’S SEXUAL HARASSMENT LAW: WHAT EVERY EMPLOYER MUST KNOWELECTION DAY IS ALMOST HERE! DO YOU KNOW YOUR OBLIGATIONS TO YOUR EMPLOYEES?